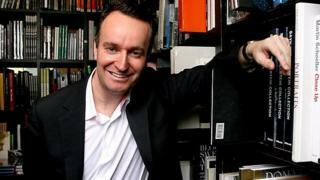 Award-winning novelist and essayist Andrew O'Hagan grew up on a council estate in Ayrshire where he delighted in being the oddball. Since the publication 20 years ago of The Missing, his ground-breaking amalgamation of memoir, social history and forensic journalism, O'Hagan has been twice nominated for the Booker prize for fiction and been the recipient of some of the most prestigious literary prizes on both sides of the Atlantic. It is a far-cry from the working class housing estate in Kilwinning in which he grew up. But his readers know that his family life in the bones of his writing and the author's voice has lost none of his Ayrshire accent despite him decamping to London as soon as he finished university. O'Hagan, who latest novel Illuminations is set in Saltcoats, tells BBC Scotland's Stark Talk programme: "There are writers who, from an early age, drop their anchors locally. "Then there are other writers like Robert Louis Stevenson, who was never more Scottish than when he was in Samoa. I'd certainly be in that category." Born in 1968, O'Hagan says his childhood was not unhappy but there were periods of "confusion and uncertainty". He says his father had a "difficult experience" of being a dad and his split from O'Hagan's mother led to her having to work hard to look after her four sons, of which Andrew was the youngest. The young O'Hagan was a voracious reader who was always pestering the teachers for more books. He says his late father once told him off for telling an interviewer there were no books in the house when he was growing up. "He said. 'There was a book. It was green. It was on top of the fridge for ages'. "I said 'that was the Kilmarnock telephone directory, that does not count'." From an early age O'Hagan was always open to looking to do things differently. "I never refused experience," he says. "I was an annoying wee pest but within that was a growing instinct to absorb experience and to cross the line." Instead of playing football, he would make daisy chains and play skipping ropes with the girls, not the done thing in the west of Scotland in the 1970s. And at the age of 10 he took up ballet, much to the annoyance of his father. "I scanned the horizon and thought what would most wind my dad up?" he says. "He was duly horrified. But then again it says something for them because they got used to it." His teenage years saw his love of literature harnessed by the teachers at his "giant" comprehensive in the middle of a housing estate where Mrs McNeil kept him behind to take him through the poetry of WB Yeats and Thomas Hardy's novels in preparation for passing exams. When he was nominated for the Booker prize for his first novel Our Fathers, he told an interviewer that on the way to the ceremony he had been thinking back to Mrs McNeil, the English teacher who helped him get in to Strathclyde University, the first in his family to go into higher education. "She really saved me," he says. "I don't know where I would have gone if I had not had that chance to find my voice." After graduation he headed for London, working first on a magazine for blind veterans before becoming editorial assistant at the London Review of Books, at the time a new radical literary journal. The job gave him access to the greatest writers of the time. "It was an open arena for literary talent," O'Hagan says. "Some of the writers that came to be great friends - Christopher Hitchens, Colm Toibin, Hillary Mantel - a lot of those writers I met on the London Review. "It was an old-fashioned apprenticeship in that way. They were very thorough. We studied a semi-colon as if our lives depended on it." And in 1995, when he was 27, he published The Missing, which was an instant success. "I thought it would be treated as a minor curiosity and people would quickly move on to something else," he says. "The fact that people took it up as an argument against the society we were living in, that really surprised me." Despite his stellar literary achievements since, he says his daughter, who was born a genetic disorder which causes speech problems, has taught him about pride in ways he had never known. "She is a startling example to everybody," he says. "She has a lovely life and lovely character and she absolutely copes in a mainstream school with her peers." He's no longer with her mother, writer India Knight, but he explains that their separation is infinitely easier than the chasm he witnessed in his own parents. "She's had a very loving and very modern and open upbringing. "Her mother and I are great friends we live very close together and we all see each other in happy circumstances every day. "That's been a great upgrade from the kinds of separations I grew up with."